Why rely on secondhanded measurements when you can go digital? 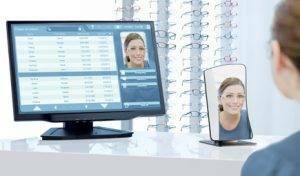 At August Wallace Eye Care, we use the M'eye Fit Mirror by Essilor, which is a portable, simple, fast, and precise device that takes electronic measurements for the best fit possible. "A simple look through the Mirror for a fast and precise measurement." The ingenuity of the design not only makes it easy for you to see yourself wearing the frame you chose, but you'll be receiving a frame & lens combination that's suited & customized just for you.